WELLINGTON, FL – January 1, 2017 – Atlantic Western Companies, headquartered in Wellington, Florida is celebrating 31 years in business, managing and selling over $1.5 billion dollars in real estate assets to date. 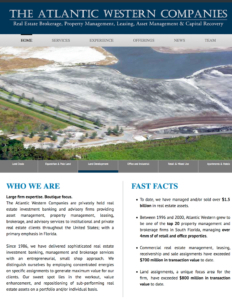 In 2016 Atlantic Western marketed and/or sold over $100,000,000 in real estate including the notable $49,000,000 sale of Gulfstream Polo Club to affiliates of Pulte Homes; one of Palm Beach Country’s largest land sales in 2016. Providing unique insight and focus on land and under-performing commercial real estate, financial institutions as well as private capital continue to select Atlantic Western as the go-to company for special situations, workouts and complex real estate transactions. “We provide cost-effective services that best allow our clients to realize maximum value potential,” says Brad Scherer, President and Founder for Atlantic Western Companies. In conjunction with their 31-year celebration, Atlantic Western has recently launched their new website, which showcases the broad range of assignments completed to date.